Posted 2/7/2019 2:02pm by Debi Miller. The sun is shining on the few inches of welcome snow on the ground. I'm sure there are many more inches of snow coming our way, and many more freezing nights left before spring. But now is the time to start planning for the season. We have seed catalogs strewn all over, and we are settling on favorite varieties and what new ones we want to try. Strawberries have been ordered and our second bed of asparagus will be ready for harvesting this year! The Farmer's Wife Flowers is expanding again this year, and will conveniently be located close to the market. I will be devoting more hours in the field so I can grow even more flowers than last year! I've ordered a few new dahlia varieties, and will be adding more unusual fillers to my mainstays. 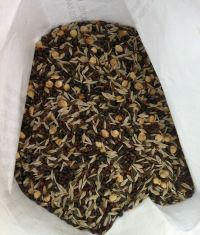 My list of seeds to start has grown to over 100 varieties! It won't be long before we start prepping the beds for this summer and getting those seeds going in the greenhouse. Come June, the farm will once again filled with beautiful organic produce and flowers! Hopefully we will see you at the farm!